If the Dail gets the sole power to declare for instance: an "Economic"State of Emergency all our rights can be suspended in the interest of saving the economy. Our right to social welfare payments, student's grants, old age pension, hospital care, carers allowance, child benefit, medicines, etc. The Right to Life of each citizen, elderly, disabled and the unborn, Family Rights, including property rights are all guaranteed in the Lisbon Treaty. The Lisbon Treaty guarantees can abolished by the Dail if the Referendum is passed. EU Justice Commissioner Reding stated recently that she wants The Charter of Fundamental Rights of the EU to be fully implemented across the Eurozone. Article 52 of the Charter gives the EU the right to place a limitation on all our rights, "if necessary", and to meet the "objectives of general interest recognised by the Union"(EU) She also stated "Experts" have been going toIreland "since 2011 making tailored recommendations on judicial reform"
WHAT ABOUT all our (other) PROPERTY RIGHTS? Where will IRISH POLITICIANS get the money to meet EU demands? PROPERTY TAX HAS already BEEN IMPOSED. Water tax is to be implemented. Pension Plans have already been raided in IRELAND. Austerity measures are causing widespread hardship. Banks have been nationalised and Family Homes in Ireland are being repossessed and The Family is being undermined by Government policy. Don't give the DAIL total power to declare a STATE ofEMERGENCY. I sense the influence of Edward Schillebeeckx in what is coming out of either real or fabricated comments from Rome and some American cities....In case you have not read Schillebeeckx, which I had to do in theology years ago, he was the extremely liberal theologian who wanted collegiality as against a powerful, infallible pope. He greatly influenced at least two of the Vatican II documents, both of which are vague, and in some minds, departures from previous teaching, Lumen Gentium and Dei Verbum. He also influenced later writers, like Fr. McBrien of NDU in his idea that the Risen Christ in His Glorified Body was not an important idea to teach. As well as faulty Christology, most of his errors have to do with the nature of the Church and the nature of priesthood. The latter person, below, as well, followed this idea of skipping Tradition and basing new ideas of the priesthood and the nature of the Church directly on the Bible. Of course, these are Protestant ideas. 2. It must also be firmly believed that Jesus of Nazareth, Son of Mary and only Saviour of the world, is the Son and Word of the Father. For the unity of the divine plan of salvation centred in Jesus Christ, it must also be held that the salvific action of the Word is accomplished in and through Jesus Christ, the Incarnate Son of the Father, as mediator of salvation for all humanity. It is therefore contrary to the Catholic faith not only to posit a separation between the Word and Jesus, or between the Word’s salvific activity and that of Jesus, but also to maintain that there is a salvific activity of the Word as such in his divinity, independent of the humanity of the Incarnate Word. 3. It must be firmly believed that Jesus Christ is the mediator, the fulfilment and the completeness of revelation. It is therefore contrary to the Catholic faith to maintain that revelation in Jesus Christ (or the revelation of Jesus Christ) is limited, incomplete or imperfect. Moreover, although full knowledge of divine revelation will be had only on the day of the Lord’s coming in glory, the historical revelation of Jesus Christ offers everything necessary for man’s salvation and has no need of completion by other religions. 5. The Church’s faith teaches that the Holy Spirit, working after the resurrection of Jesus Christ, is always the Spirit of Christ sent by the Father, who works in a salvific way in Christians as well as non-Christians. It is therefore contrary to the Catholic faith to hold that the salvific action of the Holy Spirit extends beyond the one universal salvific economy of the Incarnate Word. 6. It must be firmly believed that the Church is sign and instrument of salvation for all people. It is contrary to the Catholic faith to consider the different religions of the world as ways of salvation complementary to the Church. 8. In accordance with Catholic doctrine, it must be held that «whatever the Spirit brings about in human hearts and in the history of peoples, in cultures and religions, serves as a preparation for the Gospel (cf. Dogmatic Constitution Lumen gentium, 16)». It is therefore legitimate to maintain that the Holy Spirit accomplishes salvation in non-Christians also through those elements of truth and goodness present in the various religions; however, to hold that these religions, considered as such, are ways of salvation, has no foundation in Catholic theology, also because they contain omissions, insufficiencies and errors regarding fundamental truths about God, man and the world. After WWII, there was a surge of nationalism in Great Britain, which proved to be a surge in socialism. What has happened in this country, happened across Europe, eventually, leading to the European Union. The Sacred Cow of the British to this day is the heresy of socialism, condemned by every pope since the first half of the 19th century. Maybe I should call socialism the Golden Calf, as it is idolized. Just as certain immigrant populations benefited from the Democratic Party in the States, leading to mindless support of the Party of Death, so too, many Catholics still feel that must support Labour, or other openly socialist parties in Great Britain for similar sentimental reasons. This support blatantly contradicts reason and the long series of excellent teachings from great popes. The confusion of many lies in the misunderstanding of the role of the individual in society. I have written many posts on Gramsci, who understood over 80 years ago that the great enemy of the collective was and still is, the Catholic Church. Why? Why is it that the leading professional radical who pushed for the kulturkampf we see victorious today over Christianity could see that the Church's stand against both socialism and communism was the only true voice of reason? Why is it that so many Catholics in Great Britain cannot or will not see the dangers inherent in a social system which changed the focus of the government existing and serving the person to the ideal that the person serves the government? Why do great popes say things like this? All socialist ideologies of whatever flavor undermine the family, the authority of parents, the obedience of the child to parents, the right of all parents to be the first educators of their children, and the identity of the person in society. Socialism denies at least these three main tenets of Catholic teaching; one, the right to private property. Here is one pope, Leo XIII, on this subject. 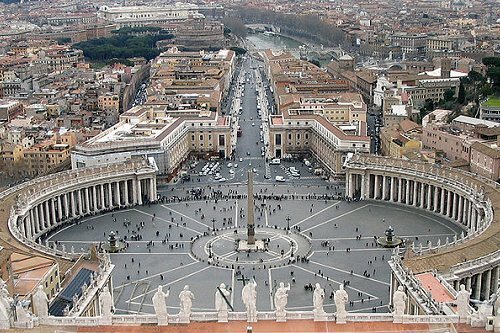 The Catholic Church has upheld the idea that natural law supports the acquiring of and the keeping of private property. Two, socialism denies the sanctity of the Kingdom of God, and replaces it with the utopianism of the kingdom of man....Here is Pope St. Pius X on this point. “But stranger still, alarming and saddening at the same time, are the audacity and frivolity of men who call themselves Catholics and dream of re-shaping society under such conditions, and of establishing on earth, over and beyond the pale of the Catholic Church, ‘the reign of love and justice’ ... What are they going to produce? ... A mere verbal and chimerical construction in which we shall see, glowing in a jumble, and in seductive confusion, the words Liberty, Justice, Fraternity, Love, Equality, and human exultation, all resting upon an ill-understood human dignity. It will be a tumultuous agitation, sterile for the end proposed, but which will benefit the less Utopian exploiters of the people. Yes, we can truly say that the Sillon, its eyes fixed on a chimera, brings Socialism in its train.” (Apostolic Letter Notre Charge Apostolique ["Our Apostolic Mandate"] to the French Bishops, August 25, 1910, condemning the movement Le Sillon). If you are a Catholic and a socialist, you are not thinking like a Catholic. One needs to repent of holding on to false ideologies of all kinds, if one is going to follow Christ in the teachings of His Church. One cannot pick and choose, like the proverbial "cafeteria Catholic". The Encyclicals quoted here, and others, must be taken seriously as part of the teaching of the Church from the highest level-the Chair of Peter. One is putting one's soul in peril by thinking one can be a socialist and a Catholic. One more quotation from the saintly Pope Emeritus, Benedict. 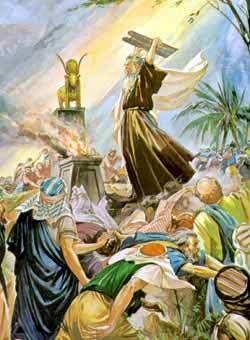 Moses heard the sound of revelry in the camp as he came down from talking with God. What he saw was a reversion to hedonism and materialism, the roots of idolatry. Some of the reasons the Israelites sinned and made the Golden Calf were that they no longer wanted to trust in God, to wait on God, to endure suffering. These sinners wanted security. They wanted to reduce Moses' emphasis on the spiritual life to a focus only on the here and now. These reasons push people into idolizing socialism. Trusting in a government to provide all is a false religious impetus. God is God, not Big Brother. Big Brother takes the place of Providence. I hope some seriously re-examine their beliefs in this flawed and non-Catholic system of government. He was one of the foundress of Tyburn's spiritual directors. He started to devote more time to preaching retreats in Belgium and in the United Kingdom, and gave spiritual direction to many communities, particularly those of Carmelite nuns. He become the confessor of Mons. Joseph Mercier, the future Cardinal, and the two formed a lasting friendship.